about hungry rebels stealing the food and burning the houses. and how can she prevent her children from starving? then perhaps she had better pay them. The Swedish Middle Ages were between 1050 and 1523. At the start of them, many strong men wanted to have power and become king. That is why there were so many uprisings and wars. if someone else wanted to take over. That meant that kings did not have that much power. The citizens of Sweden also suffered as a result of all the unrest. the king demanded taxes from the people of Sweden. The farmers paid their taxes with money and with what they grew on their farms. Even meat and hides from animals they kept and hunted were used to pay taxes. The king needed the taxes to employ more soldiers. and help create peace in Sweden. At the beginning of the 14th century, a law was drawn up for Västmanland. It stated that Herrevadsbro was one of the most important bridges in the province. you had to pass through Kolbäck and cross Herrevadsbro bridge. 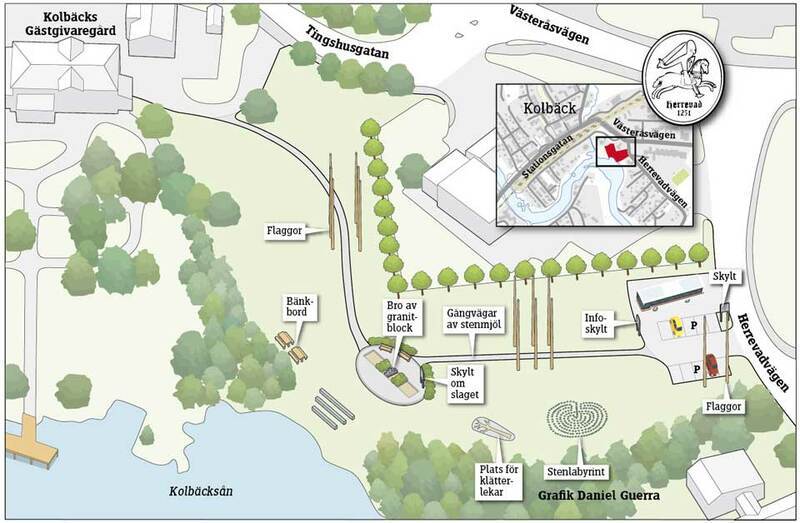 Another more important route passed through Kolbäck. and then continued towards Kvicksund where they could cross the lake. the inhabitants of Kolbäck learnt about things that were happening in other parts of Sweden. In a time when there were no newspapers, news travelled by word of mouth. Great men, merchants, monks and kings all travelled along these important routes. beautiful women in colourful clothes. to working at home on the farm. and to live another kind of life. Men were fighting all around him – friends against foe. combined with howls of pain and the screech of horses. The smell of blood and sweat filled his nostrils. A combination of fear and the feeling of fighting for a good cause. Birger jarl's name was Birger Magnusson. Jarl is a profession and during the Middle Ages the jarl was the king's right-hand man. King Erik Eriksson had no son. successor to the Swedish throne. Birger jarl was married to Erik Eriksson's sister. Birger jarl ruled the country. A group of people protested against the new king. They were called Folkungar and they wanted to decide who was to become king. The Folkungar also protested against paying taxes to the king. 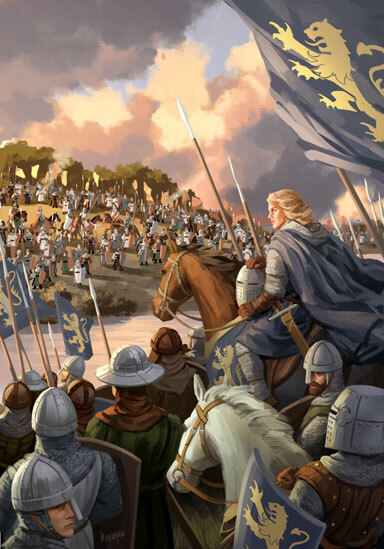 They held uprisings that Birger jarl had to stop in order to continue to have power. met the Folkungar and their men. at the bend of the Kolbäcksån River. There was a place here where you could wade across the river – herrevadet. A bridge was built and the place started to be called Herrevadsbro. and their leaders were executed at that very spot. This aroused a great deal of agitation. In fact, in old books, more is written about the executions than the battle itself. there were fewer people that wanted or dared to revolt. that remained throughout the rest of Birger jarl's life. and Birger jarl developed the system of taxation. Money from the taxes was used to build forts and employ more soldiers. Birger jarl wrote laws that protected the country from uprisings and wars. The laws also protected homes, women and the church. Anyone that broke the laws or threatened the peace was severely punished. allowing the kingdom of Sweden to prosper. The sun is warm and the water is glistening. He is holding his fishing rod, feeling drowsy from the heat. He is thinking about the battle that his father told him about. but that everyone still talks about. He suddenly feels something pull on his fishing rod. When he looks into the water he can see that he has hooked a fish. His mother will be happy when he comes home with his catch. were affected by the Battle of Herrevadsbro. remembered it for a very long time. 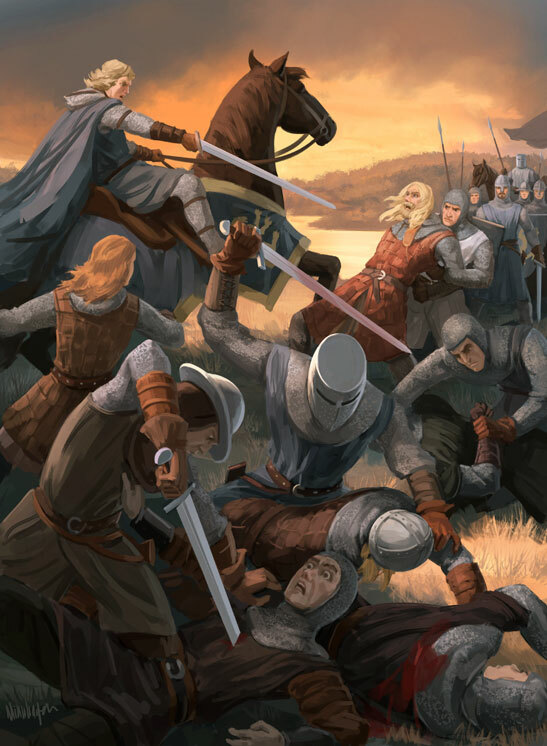 The battle became a part of the district's history that lived on in legends and tales. We can still see traces of the tales today. 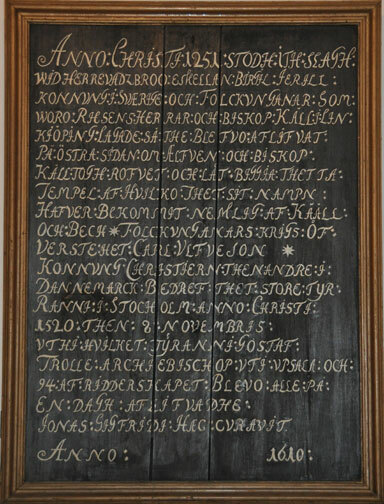 In Kolbäck's church there is a commemorative plaque from 1610 that gives an account of the battle. The text on the plaque was written a long time after the battle took place. 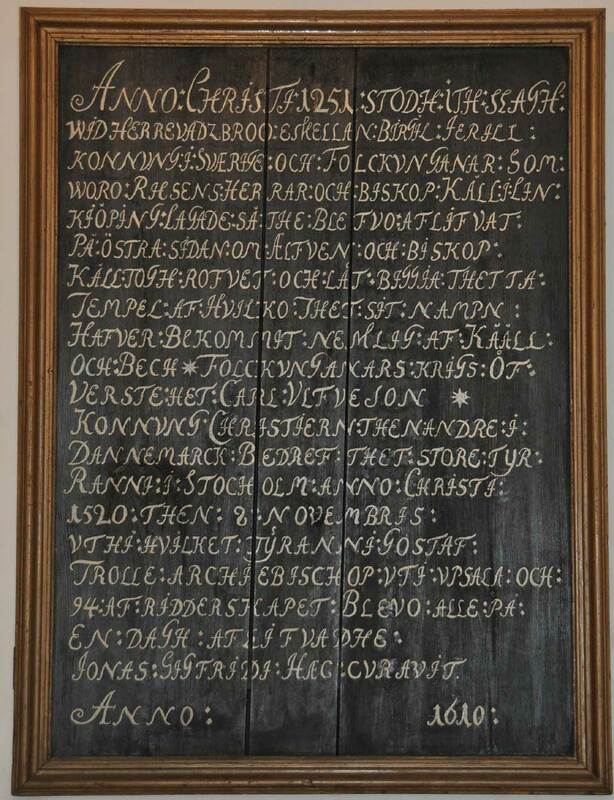 It is probably based on memories related in Kolbäck ever since the 13th century. It was so important that it was never to be forgotten. Large groups of soldiers and rebels could create a great deal of unrest. The soldiers needed food and they took it from people that lived on the farms they passed. they sometimes burnt down the houses and barns after they had plundered them. The soldiers would even kill people who were their enemies. also depended on how long the soldiers remained in the area. and then they would have needed food for themselves and their horses. They would have found the food on the farms around Herrevad. 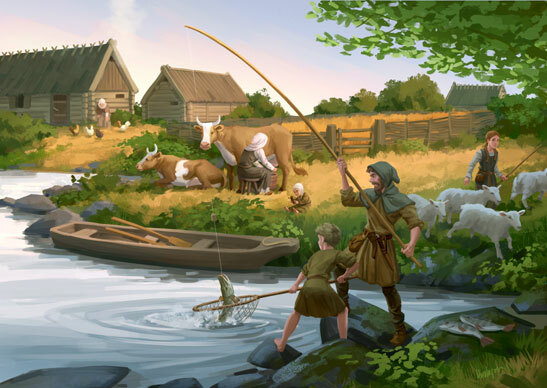 During the Middle Ages, most of the people living in Kolbäck were farmers. But life as a farmer at that time was very different to today. In many ways, life was much harder. Food supplies needed to be filled for the year ahead. The farmers grew crops on their fields and raised animals such as horses, cows and pigs. The children had to help out on the farm from a very young age. 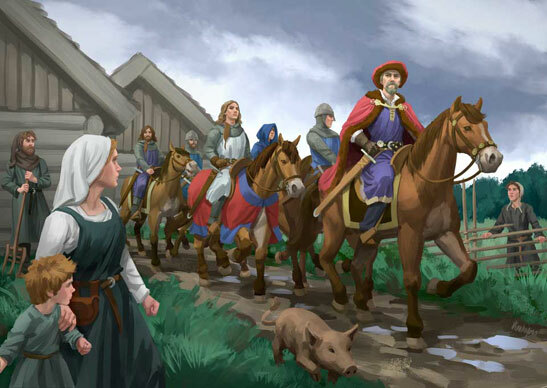 During the Middle Ages, there were no pastures. Instead, the domesticated animals roamed free. and they also protected them from predators such as foxes and wolves. The farmers also foraged for food in the woods. They hunted in the forests and fished in lakes and rivers. They needed everything they could find for their food supply to last a whole year. then many of them would starve.